A couple of bits of news to pass on. First off, BROKEN has been accepted to the Viewster Online Film Festival, Zurich Switzerland. The festival runs March 12 – 26 and marks the first overseas festival acceptance of any of my films. Nice. Also, the FRIGHT NIGHT festival has announced its screening time and location. 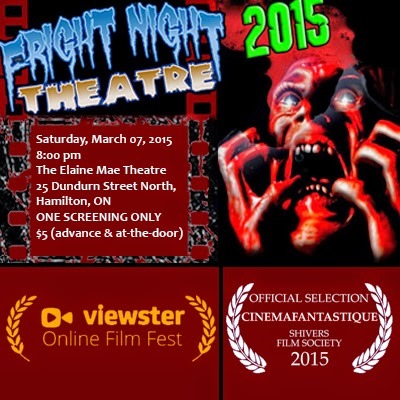 Should be a fun night of horror shorts in Hamilton. I was also sent these nice laurels from the Shivers Film Society in Vancouver which I just felt like showing off.